The phenomenon of abandoning agricultural land is the same as discontinuing the agricultural use of certain agricultural land, the causes of which should be sought in environmental, economic and social factors. 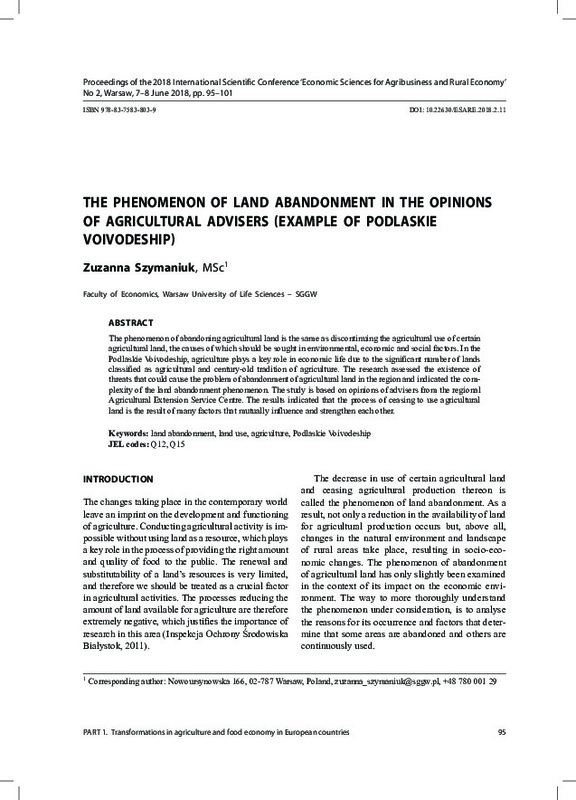 In the Podlaskie Voivodeship, agriculture plays a key role in economic life due to the significant number of lands classified as agricultural and century-old tradition of agriculture. The research assessed the existence of threats that could cause the problem of abandonment of agricultural land in the region and indicated the complexity of the land abandonment phenomenon. The study is based on opinions of advisers from the regional Agricultural Extension Service Centre. The results indicated that the process of ceasing to use agricultural land is the result of many factors that mutually influence and strengthen each other.